It’s 2018, and Americans still want their politicians to do something about their health care. Which tells you something about Americans’ health care. Polls show that once again, health care is weighing heavily on the minds of voters this election season. And that’s largely because voters think it costs too much. In August, nearly six in 10 Americans said they are very concerned about the rise in individuals’ health care costs. And just over a quarter of registered voters said that health care was the “most important” thing for candidates to talk about this election season (only corruption in Washington, with 30 percent, was cited as the most important issue more often). And the biggest concern under that giant health care umbrella? For a plurality, it was cost. That concern isn’t coming just from people who buy insurance on the marketplaces created by the Affordable Care Act, even though that’s the group we hear about most often. People with employer-sponsored insurance are also paying more for health insurance and facing serious concerns about how they will pay their medical bills in the event they need care. A new survey from the Kaiser Family Foundation helps explain why: Employees are picking up more of the cost, even when they are covered through their employer. The cost of employer-sponsored insurance has been relatively stable, increasing by about 3 percent for an individual plan and 5 percent for a family plan. Those increases are relatively small by health insurance standards, but they are still outgrowing inflation and workers’ earnings, meaning insurance costs eat up a larger share of worker compensation than they have in previous years. The price of employer-sponsored insurance varies significantly, but for more than half of workers with plans that covered their families, the annual cost was between $16,000 and $22,000 a year. Workers tend to be picking up a larger share of that check than they have in the past. In 2000, the average family with an employer-provided plan paid 25 percent of the total cost of an annual insurance premium. By 2018, it was 28 percent (down from 30 percent in 2017), according to the annual KFF survey. Premiums are just one way that employees’ health care costs have gone up in recent years. Many are also facing higher out-of-pocket expenses than they have in the past. For example, more and more people are enrolled in plans with high deductibles. 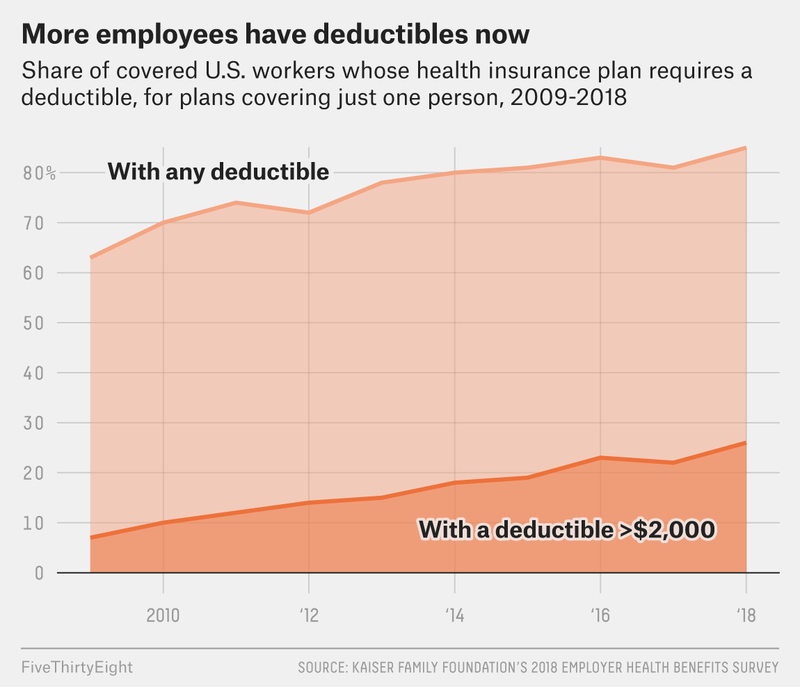 In 2010, one in 10 workers with single-person health insurance coverage had a plan that required a deductible of $2,000 or more. By 2018, one in four did. Deductibles overall have grown eight times faster than wages, according to KFF. And there’s another thing: surprise bills. In an August survey, 37 percent of people with employer coverage said they’d received a bill for health care costs that they weren’t expecting, either because they thought their insurance company would cover it, or because they thought the insurer would foot a larger share of the bill. All of this adds up to workers paying a lot more for health care purchased with the help of an employer than they have in the past. That helps explain why people with employer-sponsored insurance are nearly as worried about paying their medical bills as are the public as a whole. In the August poll, KFF asked adults1 how worried they were about being able to afford an unexpected medical bill. Nearly a third of people with insurance from an employer said they were very worried; 38 percent of all insured adults said the same. Almost a quarter of those with employer-sponsored insurance said they were very worried about being able to pay their deductible, according to data provided to FiveThirtyEight, with a nearly identical percentage of all insured adults feeling the same way. In other words, many voters share the same worries, but the solutions they prefer split along predictable lines. “We know from all our years of polling that feelings about health care come down to political affiliation,” said Liz Hamel, director of public opinion and survey research for KFF. The survey asked different questions of Republicans and Democrats: Republicans were asked whether lawmakers should focus on fixing the ACA or repealing it. Democrats were asked whether lawmakers should focus on fixing the law or trying to pass a national health system.